Social media has grown to become an essential tool at the disposal of the UK's police forces and special units and, handled properly, police social media accounts with a big enough following can provide a powerful way to speak directly to the people they serve. Police comms can use social media in a variety of ways, but which forces do it best? From warning people to avoid the scene of a serious incident and providing clear advice, to releasing images of wanted individuals and receiving up-to-the-second sightings from the public in response; social media has come to make a valuable contribution to policing the UK. However, the judicious use of humour on social media in non-emergency situations also has a wider, though not immediately obvious, application: that of engaging the public and putting a human face on the often serious business of maintaining law and order. This is especially important in the light of research by ApComm, which showed that younger people are one of the hardest audiences for police forces to win over. 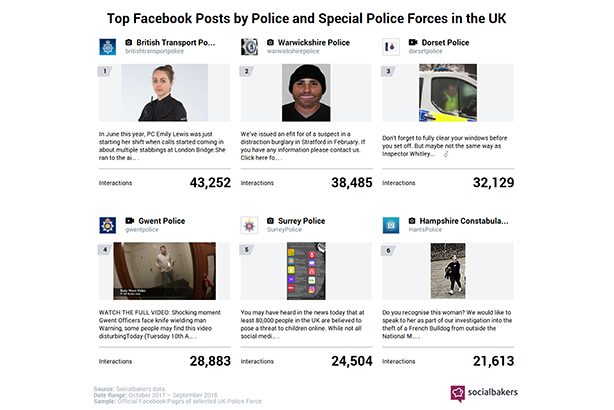 Exclusive research for PRWeek by social-analytics company Social Bakers reveals how the UK’s police forces performed on three key platforms in the 12 months to the end of September 2018. To arrive at our conclusions, the main corporate accounts of the UK’s 45 police forces were measured, as well as those of five specialist units, including British Transport Police, Counter Terrorism Policing and Ministry of Defence Police. 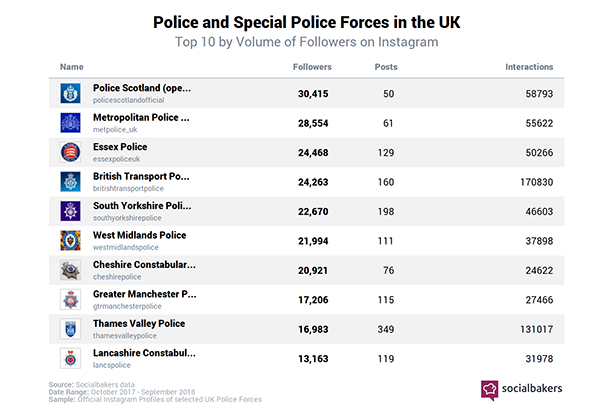 Winning the battle for fans on the world’s most popular social platform was Police Scotland, with nearly 285,000 followers – 30,000 more than its nearest competitor, Greater Manchester Police. 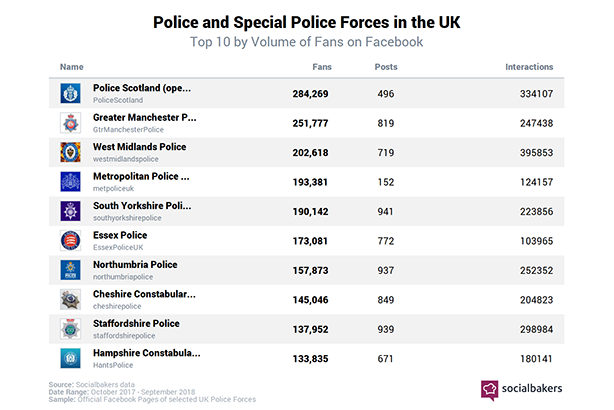 Making up the top five for Facebook fans were West Midlands Police, Metropolitan Police and South Yorkshire Police. 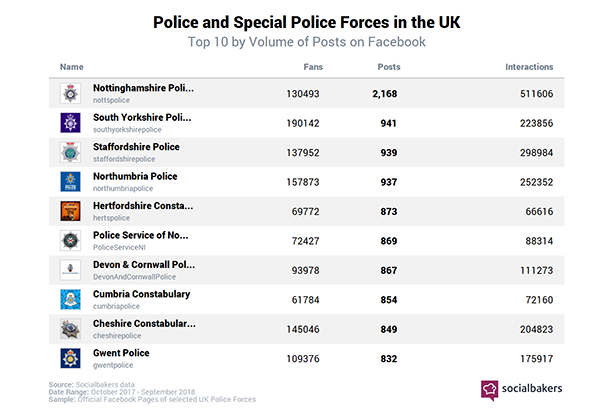 The most prolific force was Nottinghamshire Police, which posted nearly 2,200 times on Facebook in the past 12 months – more than double the number from its nearest competitor, South Yorkshire Police. 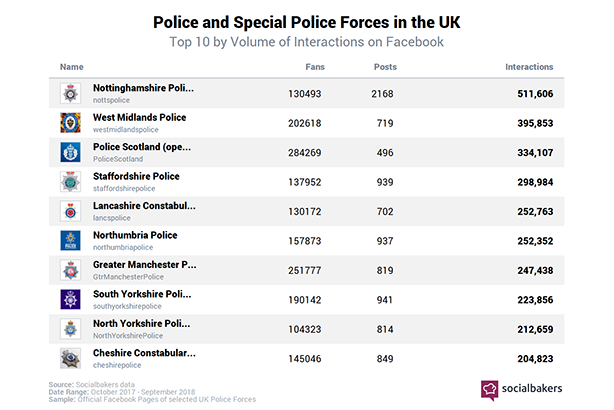 Making up the top five for the number of Facebook posts in this period were Staffordshire Police, Northumbria Police and Hertfordshire Constabulary. One of the most important measures of effectiveness on a social-media platform is not the number of fans or posts, but how much the public interacts with them. By this measure, Nottinghamshire Police stood head and shoulders above every other force in the UK, with more than 500,000 interactions over 12 months. This total was over 100,000 more than its nearest rival, West Midlands Police, on nearly 400,000 interactions. Police Scotland, Staffordshire Police and Lancashire Constabulary made up the top five. Commenting on the results of the research, Donna Jordan, head of corporate comms at Nottinghamshire Police, said social media was now an essential tool in its comms armoury. She said: "With limited resources, we regularly use Facebook to promote results including court outcomes or clips of police in action so that justice is seen, where justice is done. We also encourage the public to play their part by helping us with our appeals, identifying suspects via CCTV, following safety advice or tracing missing people." Jordan said Facebook gave the force the opportunity to include a lot of content in its posts that gave rise to the potential for essential two-way interaction with the public. She continued: "People often feel as though they are doing their bit to help an investigation by sharing the post far and wide. We have had some fantastic results from this, including the daughter of a suspect caught on CCTV commenting directly on our post, a missing person located when someone noticed them while looking on their phone in McDonald's, and people handing themselves in having identified themselves on Facebook." Among the forces that used Facebook most effectively, the research sought to tease out which single posts garnered the most interaction during the 12-month period. British Transport Police (BTP) lead the field with its post highlighting the bravery of one of its officers, PC Emily Lewis, for her actions during last summer’s London Bridge terrorist attack, when London's Evening Standard newspaper named her as one of its '12 Everyday Heroes'. The post received more than 43,000 interactions, including nearly 3,000 shares and 1,500 comments from followers. Warwickshire Police and Dorset Police were responsible for the second and third most-interacted-with Facebook posts. The picture-based social platform is the sixth-most popular in the world by number of users, and the second-most popular among 16- to 24-year olds, according to the latest available figures. Once again, Police Scotland led the way, with the highest number of Instagram followers – more than 30,000 during the period measured. However, snapping at its heels was the Metropolitan Police, with nearly 29,000. Essex Police, BTP and South Yorkshire Police made up the rest of the top five. 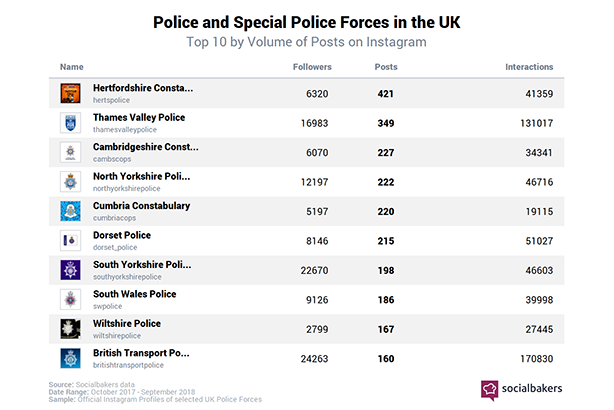 In a closely fought contest, it was Hertfordshire Constabulary that took the top spot with 421 Instagram posts in the 12-month period – more than one a day. This pipped Thames Valley Police, with 349 posts in 12 months. Cambridgeshire Constabulary, North Yorkshire Police and Cumbria Constabulary made up the top five. Giles Cooper, senior press officer at Hertfordshire Constabulary, told PRWeek that Instagram was not previously used by the force, but it decided to do so after carrying out a survey of local people. He added: "Instagram scored really highly among those of school age, which is an age we want to… influence and engage with positively." Nonetheless, the name of the game is engagement and, by this measure, it was BTP that demonstrated it had the most successful social-media strategy on Instagram, with nearly 171,000 interactions from just 160 posts over the past 12 months. 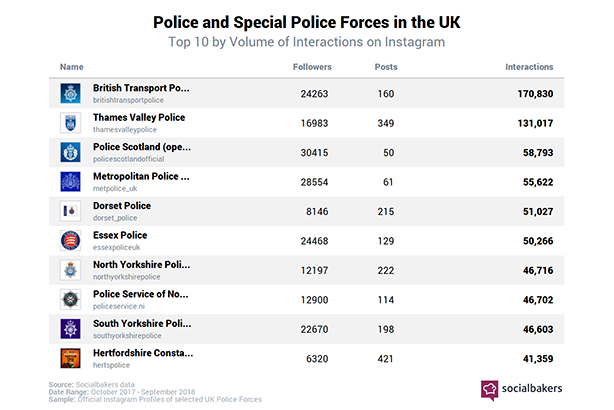 Thames Valley Police was in second place for engagement on Instagram, with 131,000 interactions from nearly 350 posts. 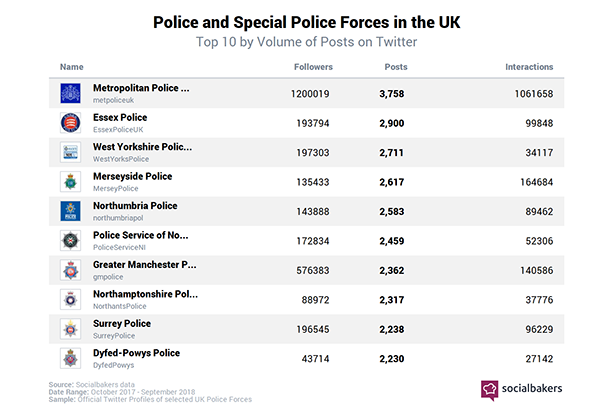 There was then a sharp drop, to nearly 59,000 interactions from 50 posts for third-placed Police Scotland; making up the top five were the Metropolitan Police and Dorset Police. Allison Potter-Drake, head of corporate comms at BTP, told PRWeek that an important reason for engaging with the public was to build up their confidence in the abilities and skills of the specialist force. She explained that all social platforms offered the force an opportunity to engage with different audiences and it had developed a specific strategy regarding Instagram. Potter-Drake said: "As symbols of authority, it’s not always easy for police forces to gain the confidence of younger audiences. With more than 60 per cent of our following on Instagram being under 35, we believe it is currently the right platform to gain engagement with this often hard-to-reach audience." It was important that BTP’s Instagram account was not simply a portal for operational policing and crime appeals, which it mainly posted on its Facebook account, she continued. "We try to make it a fun and informal environment which also showcases the specialism of BTP. The team have worked hard to develop the right tone, avoiding formalities. Captions are key and humour not only has a massive impact on our engagement and following, but the team have great fun in creating them." Once again, our research looked at which individual Instagram posts won the highest engagement during the 12-month period. Dorset Police used the icy conditions in early March, during the so-called 'Beast from the East' cold wave, to create the Instagram post that achieved the highest interaction of any of the forces measured. 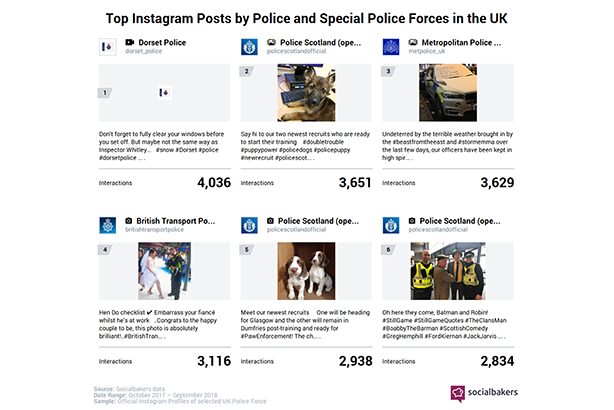 Police Scotland was in second place and appears three times in the top six, with its posts about new police dogs, while the Metropolitan Police and British Transport Police also had some of the highest interactions from a single post. Kristian Ward, comms officer for Dorset Police, who filmed the content and created the top post, told PRWeek: "Instagram is a fantastic tool for us to educate the public about what we do, share messages about the prevention of crime and give a bit of a behind-the-scenes look into the world of policing… We have a whole wealth of really great content at our fingertips, and try to focus on creative and timely content, delivered in a way that members of the public can genuinely relate to and understand." Ward added that the force adapted its social-media style to the typical demographic of Instagram and had grown its followers to 8,500 over two years. He said: "The platform style and typically younger audience allows us, as publishers, to be a bit less corporate in our posts and the way we interact with our followers, differentiating it from our other social-media platforms. This approach works particularly well as people often don’t expect police forces to be using stories, filters, emojis and capitalising on current social-media trends." Although it is not in the top 10 social-media platforms by number of users, Twitter is nonetheless one of the most news-focused, real-time channels available to police forces. During the terrorist attack on Westminster Bridge last year, the Metropolitan Police successfully used the platform to inform the public about the threat, putting out its first bit of communications in the form of a tweet within seven minutes of the incident taking place. The Met’s Twitter following numbers beats its nearest competitor by more than two to one, with 1.2 million followers of the corporate account, compared to 576,000 for Greater Manchester Police. 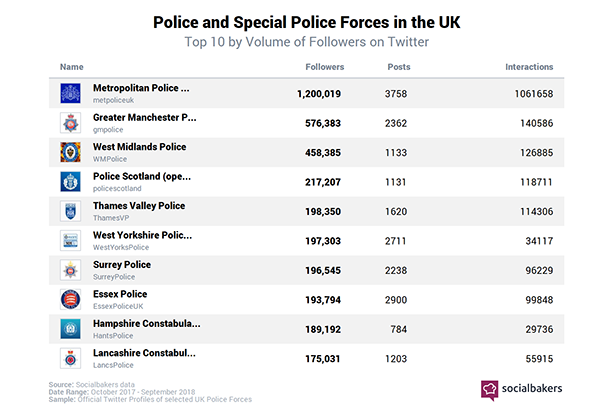 West Midlands Police, with nearly 460,000, Police Scotland on 217,000 and Thames Valley Police on nearly 200,000 made up the top five forces for Twitter followers across the UK. Britain's biggest police force was also top for volume of posts, with nearly 3,800 in the 12 months measured, followed by Essex Police on 2,900. West Yorkshire Police, Merseyside Police and Northumbria Police made up the top five. 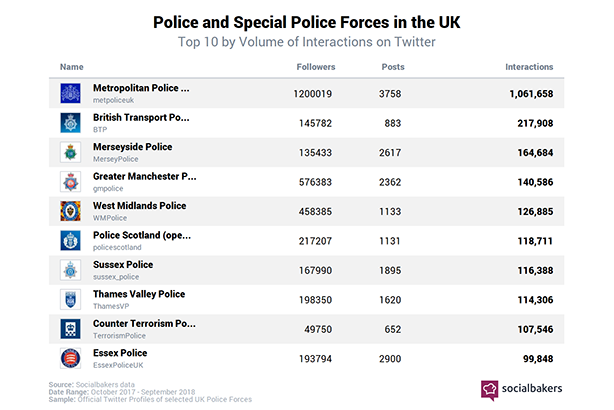 It is hardly surprising, given the volume of followers and posts, that the Met also scored highest for the level of interaction with the public. Interactions with the Met’s Twitter account dwarfed the figures for its nearest competitor by nearly five to one, with more than a million interactions in the 12-month period, compared with 217,000 for BTP. Merseyside Police, Greater Manchester Police and West Midlands Police made up the top five. Our research also studied which individual Twitter posts scored highest for interactions during the period. By this measure, a tweet by Warwickshire Police, showing an e-fit of a suspect in a distraction burglary, scored highest with nearly 60,000 interactions, including nearly 22,000 retweets. In second place was Dorset Police with a version of its successful Instagram post in tweet form, which won nearly 47,000 interactions. 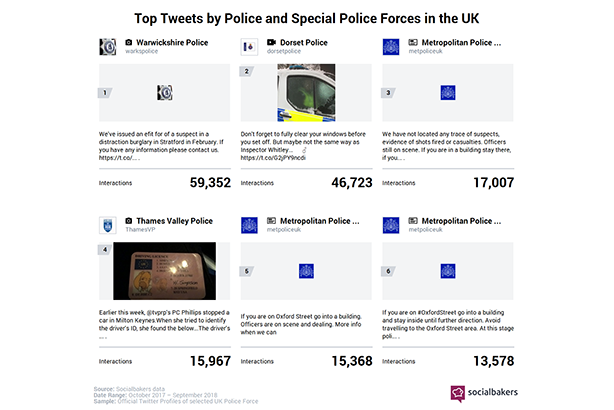 Thames Valley Police garnered nearly 16,000 interactions for a single tweet, while three posts by the Met made up the top six. Catherine Foster, corporate comms manager at Warwickshire and West Mercia Police, said: "Twitter is one of our most successful channels and indeed one of the most popular with our police officers. It allows us to speak to the public in real time and provide live updates, or, in this case, have an appeal widely shared within minutes. It also invites conversation and builds supportive online communities." Foster said the force anticipated public interest in its unusual e-fit picture and used it to capture the public’s imagination, even beyond its operational borders. She added: "By responding to the public's comments using a conversational, human tone, we were able to raise awareness of the impact distraction burglary has on its often vulnerable victims. We were also able to educate the public around the e-fit process. Ultimately content is key, and overall we have had great success when using rich visual media across our digital platforms." As police comms teams around the country learn to do more with fewer financial and human resources at their disposal, social media has emerged as a hugely important set of comms channels to speak to and interact with the publics they serve. Used effectively, social media can aid operational aspects of policing, such as warning the public to avoid the location of a major incident within minutes of it taking place. It can also disseminate images of suspects and turn the public into armchair detectives, helping police forces to locate the individuals. Perhaps most important, using the specific nuances and demographics of each channel, social media can be used to begin a conversation with the public, building trust and lending a human, sometimes even humorous, face to the forces of law and order. 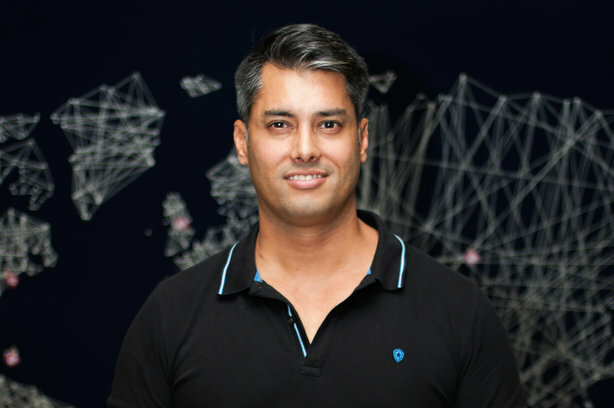 Moses Velasco (above), chief of strategy at Socialbakers, told PRWeek: "Social media, when used correctly, can act as a bridge between police forces and the general public. Whether it's appeals for information, the reporting of incidents, or just simply recommendations for how to stay safe, one thing the police services can count on: their audience is on social media. 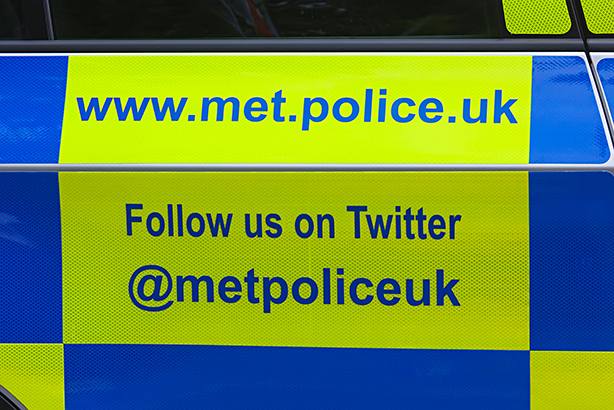 London's Metropolitan Police, with its 1.2 million followers on Twitter, share frequent updates in video and text format, to keep their broader community engaged and aware. They also use the platform to portray the positive things they are doing in the community, using social to show the softer side of the Blue." Which local authorities in Scotland, Wales and Northern Ireland are best at using Twitter? Which local authorities in England are best at using Twitter?